In any major catastrophe, it is the volunteers who form the backbone for relief work that helps survivors recover and move on. DEEPAK GILL and LEONG SIOK HUI find out how you can lend a hand. In disasters, man-made or natural, the spirit of helping those in need has always been present – among rescuers, medical personnel or just about any person. They help selflessly without expecting anything in return but the deep satisfaction of doing the right thing. A lot of times these volunteers step up and eventually withdraw silently as nameless heroes. It’s such people that are now scattered all over the shores and districts that were affected by the Dec 26 tsunami. After the frenzy of these dramatic weeks loses its steam, volunteers will still be needed for a long time. The work is only just beginning. However, many of us don’t know how to go about becoming a volunteer. This article aims to highlight several main organisations that the public could get involved in with regards to the tragedy. When Capt K. Balasupramaniam and his team of six volunteers from the Yayasan Salam Malaysia-Malaysian Volunteer Fire and Rescue Association (MVFRA) arrived in Banda Aceh last week, their mission was to recover and rescue victims, assess the situation and set up a relief centre. Boxes of food were stacked up at the “post command” (collection) centres but none were being distributed to the needy, Bala recalled. So his team immediately switched their focus to relief work, hiring a local truck to ferry food to villages. A volunteer doctor also instructed Bala’s team to hand out stress-reduction pills to the many children whose parents were either missing or dead. The team, however, found themselves short of doctors or counsellors who could offer one-on-one help to the traumatised kids. “What we need most now is any form of transport to bring water, food and medical help to people in the isolated villages,” said Bala, whose team returned to Malaysia after seven days. So bad was the transportation problem that the Buddhist Tzu Chi Merits Society volunteers, who had abundant supplies of food and medicine, encountered trouble trying to get a truck to reach the villages. To date, the Malaysian Red Crescent Society (MRCS) has sent 20 volunteers to Aceh, said Dr S. Selva Jothi, the society’s National Disaster Management Committee chairman. “Our First Aiders (advance First Aid-trained volunteers) help the doctors by registering the patients, cleaning and dressing their wounds or treating minor injuries,” said Dr Selva who returned to Kuala Lumpur last week from Sumatra. Other MRCS volunteers hand out food and clothing while a team of cooks whip up hot meals for the rescue workers. “But we’d rather not take non-members as volunteers because they’re not insured,” said Dr Selva. Bear in mind that being a volunteer during a disaster isn’t exactly a picnic by the beach with just a bit of work thrown in. Aside from dealing with corpses and the obnoxious stench, massive destruction and traumatised survivors, a volunteer has to rough out whatever comes his or her way. If you expect three square meals a day, for example, you might be in for a disappointment. Bala and his team had to live on chocolate bars and dry food for the first five days. “We finally got our first hot meal the day before we left Aceh,” he said. Bala’s hands developed rashes from extensive contact with corpses and because he didn’t get to shower for days. Going to the toilet was no fun either. All this, coupled with the stress of trying to make things right for the victims everyday, may deflate morale. But if you still think you have what it takes to be a volunteer and are willing to spare the time, you are always welcome. Most organisations that deploy volunteers to disaster areas, like MRCS, MERCY or MVFRA, require trained people. One of the newest international aid organisations around, Mercy Malaysia’s intrepid volunteer team has made its mark on several occasions around the world. From braving bullets in Iraq and being one of the first aid agencies to arrive in Aceh, the five-year-old organisation derives its strength and sense of urgency from its dedicated group of several hundred volunteers and members, as well as its small staff. 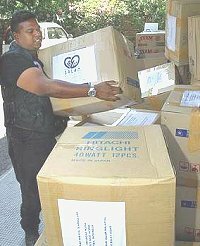 The home-grown medical relief organisation undertakes international and local humanitarian efforts and has many young professionals in its ranks. Anyone aged 18 and above can become a Mercy member or volunteer. This involves undergoing various training programmes to improve skills, preparedness and confidence. There are several types of programmes: orientation, volunteer induction, basic life support, basic mission training, writing skills, photography and foreign languages. Most courses are provided free of charge, others require a token contribution. To date, more than 300 Mercy Malaysia volunteers have been on dozens of international relief missions, and all have returned alive. Only a minority of volunteers go on international missions; what Mercy regularly needs help with is fundraising. Mercy is very involved in local community work, with an emphasis on disaster relief, drug rehabilitation and mobile clinic services. Among Mercy’s non-medical volunteers are engineers, architects, bankers, housewives, lawyers, students, lecturers, writers, photographers, aid workers, IT specialists, consultants, the unemployed – basically, regular people with diverse professions who come together. The society’s president, Dr Jemilah Mahmood, is a volunteer herself. For details go to www.mercy.org.my, e-mail volunteer@mercy.org.my or call (03) 4256-9999. The MRCS is a member of the world’s largest and most influential independent humanitarian organisation, the International Red Cross and Red Crescent Movement. To become a Red Crescent volunteer, you pay a RM1 annual membership fee and attend training courses like First Aid and International Humanitarian Law. Join the Rapid Deployment Squad and provide relief to victims of such disasters as fire, flood, landslide, etc. Or volunteer your First Aid skills in the emergency ambulance service. An independent, non-profit organisation, SALAM was founded in 1997 to promote the volunteer spirit among Malaysians by providing them with opportunities to work with communities at home and abroad. SALAM organises volunteer service programmes in various fields, focusing especially on education, health and community development work. Activities are funded by contribution from individuals, corporate bodies and the government. SALAM also acts as a centre that maintains the names and details of volunteers and refers them to national and international organisations. Formed in 1990 by three young members of The Malaysian Fire & Rescue Cadet Corp, MVFRA backs up the Fire and Rescue Department and conducts fire prevention activities in the Klang Valley. Pick up First Aid and rescue techniques when you sign up for training as a volunteer for MVFRA’s Disaster Response and Relief Unit. Since the tsunami disaster, volunteers from this low-profile organisation have been working quietly behind the scenes in most of the affected regions. Capt K. Balasupramaniam dubbed them “the unsung heroes” of the Aceh relief operation. This non-profit organisation with four million members worldwide was founded in Taiwan. Volunteers come from diverse backgrounds, races and religions. The organisation does charity work, conducts education and community development programmes as well as medical missions. This project by the Miss MalaysiaIndia Care Association with the support of Klinik Healthcare and Surgeri and Mahameru Consultancy calls for youths to go on a 10- to 14-day programme to Indonesia or Sri Lanka. Medical, engineering or mass communication volunteers aged 18-35 are preferred. Volunteers will provide medical relief, build shelters and record data. The project is still looking for sponsors to cover the flight expenses to Sri Lanka.